In recent months the team at Kurin, Inc., manufacturer of the only FDA cleared blood culture diversion device, has received a wealth of clinical data from early adopter hospitals. In May, Crouse Hospital in Syracuse, NY, published a 56% overall reduction in contaminated blood cultures inclusive of all cultures drawn with or without the device. 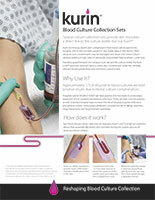 When a Kurin set was used in the blood collection, Crouse saw an 89% reduction in contaminated blood cultures. A month later, Bayfront Health presented a 54% overall reduction and a 90% reduction in contaminated cultures when Kurin was used. In both cases, the hospitals were already below the 3% national contamination rate benchmark when they began using Kurin. By addressing skin contaminants using Kurin’s passive diversion technology, the hospitals drove their overall contamination rates down to 0.8% and 1.2% respectively. Commenting on the results, Kurin CEO Bob Rogers said, “For a decade, hospitals have been striving to achieve 3% contamination rates per industry guidance, yet it is now clear that 3% is far too lax a goal. With best practice compliance and specimen diversion for every collection, clinical data establishes that hospitals can maintain contamination rates of 1% or less, and save significantly by reducing unneeded treatment.” Indeed, Crouse and Bayfront reported annual cost savings of $185,000 and $430,000, respectively. The founders of Kurin are familiar with what it takes to change clinical practice. As the creators of CurosTMdisinfecting port protectors, now a product and trademark of 3M, the team radically changed infusion port disinfection protocol leading to improvements in catheter related bloodstream infection rates across the country. 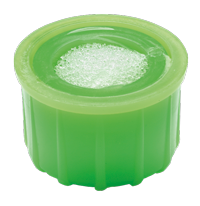 Today passive disinfection caps have become the standard of care for hospitals to reduce their bloodstream infections. As part of this effort, Kurin is releasing a 5-minute documentary film entitled Cry Wolf to illuminate the prevalence of blood culture contamination, the clinical impact on patients, and the steep associated costs for hospitals. Cry Wolf debuts in partnership with CAP Today during the month of September 2018. View Cry Wolf at www.captodayonline.com starting September 18th. Additional resources may be found at www.betterbloodcultures.com, including the results described above, an annotated bibliography of studies on the topic, an educational video, blood culture contamination facts, and a listing of current industry standards. https://www.kurin.com/wp-content/uploads/KurinLOGO.png 0 0 webmin https://www.kurin.com/wp-content/uploads/KurinLOGO.png webmin2018-08-31 15:24:522018-08-31 15:24:52Clinical results of Kurin specimen diversion technology signal a shift in the blood culture collection standard of care.